Bill Elliott, not just a good driver. 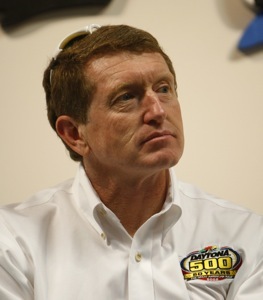 Nashville – The first time I met Bill Elliott was in the early 1970’s as I was speeding down a California turnpike one Sunday morning on my way to cover a race at Riverside Raceway. Up ahead I noticed a car on the side of the road, hood up, steam spewing out. Two men were standing beside the car and as I whizzed past I recognized one of them – Benny Parsons, a popular driver and a long-time friend. I stopped and backed up. Last Sunday Bill was at Fairgrounds Speedway to watch his 14-year-old son Chase run a CRA event. We talked about that first meeting, how the years have flown by, how much we miss Benny and all other greats in the sport. Also on hand was Kyle Busch – the talented but troubled young driver who represents NASCAR’s Generation X.
I was struck by the difference: the affable Elliott and the belligerent Busch, who creates an aura of tension wherever he goes. Maybe I’m just getting old and forgetful, but I don’t recall past generations of drivers having such behavior problems. Oh, Darrell Waltrip would spout off now and then but it was generally good-natured and mischievous, and Dale Earnhardt could act rough and gruff but he too generally had a twinkle in his eye. Cale Yarborough was a bulldog on the track but delightful company when the engines were turned off. Ditto for Buddy Baker, Bobby and Donnie Allison, Harry Gant, Richard Petty, David Pearson, Parsons, Ricky Rudd, Ken Schrader, Sterling Marlin, Rusty Wallace, Dale Jarrett and most all of the old gang. I don’t know if the younger generation is too rich or too spoiled or too what, but they’re definitely different. I think that’s one reason why Mark Martin remains such a fan favorite – he’s a likable link between the sport’s yesterday and today. Elliott, too, continues to race on a part-time basis and remains just as popular – and classy – as he was in his heyday. It was fun hanging out and chatting with Elliott the other day. It was a refreshing reminder of how things used to be back when you could talk to a driver without making an appointment through a PR handler, or have to worry about getting your head bitten off by some over-paid prima donna barely out of his Pampers. Thank you for a great story about a great person, Bill Elliott. Yes, it is a different generation of drivers and frankly a different generation of fans to some extent. Woody, I’m sure you can remember being able to go to the beach after the Firecracker 400 in Daytona and some of the drivers and their families would be enjoying the beach and no one bothered them for the most part. Now, with TV covering their every move, some of them have begun to believe their own press clippings and actually believe they are above their “common person” fan base. Throw in the handlers, who actually believe they have the right to call anyone out for questioning their personally perceived authority, and you can have a bunch of spoiled rich brats. There is some validity for insulating drivers because fans can be nutty at times. In the “old days” drivers thought it was a privilege to be popular with fans, now some of them believe fans are a necessary evil and they are indeed godly like (see press clippings above!). Once, drivers sought out media of any type to gain a little extra publicity for themselves and their sponsors. Now, with TV at their beck and call, they basically refuse to speak with local media. But, such is the way of all people that the public deem stars. These “stars” are, for the most part, of our own making. Too bad cause it’s just going to get worse.